Lightning is a male peregrine falcon who hatched in captivity and was brought to Richmond Hill on July 6, 2001. After 17 days in the hack box on the roof of the Richmond Hill Town Hall, Lightning was released, and he took flight the next day at 41 days of age. On August 1 Lightning was recaptured, and fitted with a 20-gram satellite transmitter, making him the fourth peregrine falcon from Richmond Hill to be followed through Project Track-'em. In October, Lightning began his southbound migration. He narrowly escaped Hurricane Michelle in Cuba, then settled in the Dominican Republic for the winter. He eventually attracted the attention of local citizens, and since late February has become a celebrity across the Dominican Republic and beyond. Full reports on Lightning's activities are posted below in reverse chronological order. Updates are added when we receive satellite transmissions every 4-5 days, or when there is other news of any kind. (Note: the battery powering the transmitter has run out of power. Reports posted below will be based on visual sightings of Lightning). November 24, 2002: Marcel Gahbauer reports: By this time last year, Lightning was settled into his winter home in the Dominican Republic. However, up until at least a week ago, he was still being seen quite regularly at his Toronto territory, near the intersection of Yonge and Finch in North York. Most commonly he perches on the 18th or 19th floors on 5700 Yonge Street (diagonally across from the GO / TTC bus terminals), but may be seen elsewhere in the area too. Additional recent photos of Lightning have been added to his photo gallery. September 24, 2002: Marcel Gahbauer reports: Peregrine migration in Ontario has now begun in earnest, but Lightning for one shows no signs of leaving yet. He was seen again today by James Ingham at his (semi-)usual hangout in North York in the Yonge / Finch area. August 13, 2002: Marcel Gahbauer reports: Once again James Ingham has notified us of Lightning putting in an appearance at Yonge & Finch in North York ... he clearly continues to show an interest in this area, yet must also be spending time at another site to account for his absences in between sightings. July 31, 2002: Marcel Gahbauer reports: Lightning has put in another appearance at Yonge and Finch, as shown in the newest photos provided by James Ingham. July 22, 2002: Marcel Gahbauer reports: After an absence of approximately three weeks, Lightning was spotted again today just northwest of Yonge and Finch in North York. Thanks to James Ingham for passing along this information. It would appear that while Lightning retains some interest in this location, he is now spending more time at an alternate site - if anyone can provide us with information on where this might be, we would be very interested in hearing about it at track-em@peregrine-foundation.ca. July 9, 2002: Marcel Gahbauer reports: Over the past four weeks, the reports of Lightning have become much scarcer. It appears that he is not as settled in around Yonge/Finch as it first appeared. He continues to appear in the area periodically, most recently seen by Ian Reid flying past 5650 Yonge on July 3. However, the periods of absence suggest that he is now spending quite a bit of time elsewhere - perhaps roaming about in search of a suitable nest site for next year, or perhaps already hanging out at his selected location, wherever it may be. June 11, 2002: Marcel Gahbauer reports: 1:00 pm. It has been close to a week since Lightning was last reported to us from North York. While the buildings provided good vantage points for hunting, it's possible that he has resumed his peregrinations in search of a female companion. 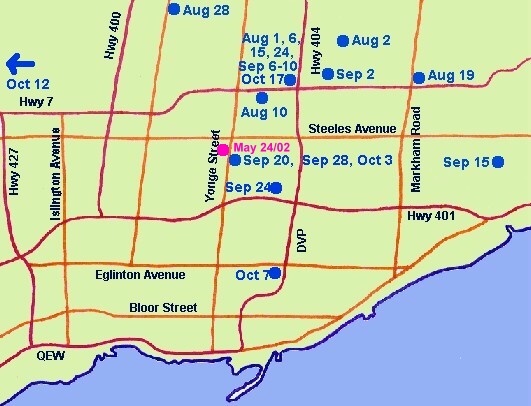 However, considering that Lightning has already visited the Yonge / Finch area previously (see the Sep 28 & Oct 3 reports below), it's possible he may return here again once he has found a mate. Chances are that Lightning will remain somewhere in the Greater Toronto Area, at least for the near future, so once again, we encourage everyone to keep on the lookout for him, and report all sightings to us at track-em@peregrine-foundation.ca. 3:30 pm. Sure enough, just a couple of hours after posting the message above, I received a report from James Ingham indicating that Lightning was back at his office! Quickly he settled in for another nap, as if he had never left. See Lightning's Gallery for a couple of new photos. June 6, 2002: Marcel Gahbauer reports: See the Lightning Photo Gallery for a series of pictures taken recently at his new home in North York - he is already looking very much like an adult peregrine! June 5, 2002: 43.8N, 79.4W (North York, Ontario). Marcel Gahbauer reports: Lightning remains in North York, primarily around Yonge and Finch, where he seems to be favouring the tall building at 5700 Yonge Street. Meanwhile, Lightning remains popular in his winter home of the Dominican Republic, featured in another article today (the 16th article in our collection below). June 3, 2002: 43.8N, 79.4W (North York, Ontario). Marcel Gahbauer reports: As of today we have confirmation that it is in fact Lightning who has been spotted by several observers along Yonge Street in North York, thanks to a photograph sent in by one of them. This, and a few other photos will be added to Lightning's photo gallery later this week. May 30, 2002: 43.8N, 79.4W (North York, Ontario). Marcel Gahbauer reports: Over the past two days, we have received reports from James Ingham at 5700 Yonge Street in North York, who has been watching a transmitter-wearing peregrine from his 18th floor office. According to James, "He looks good and it appears he is moulting for spring. I've spoken with several of my fellow staff members and they have all stated that he has been here before and that he has been here for a little over a week. We can see the remains of at least five or six meals on the balcony." Thanks also to Ian Reid and Marie Martinez for their reports of Lightning along the same stretch of Yonge Street; Marie was the first to confirm to us Lightning's band number. May 28, 2002: 44.0N, 79.8W (Brampton, Ontario). Marcel Gahbauer reports: Today we received another single transmission from Lightning, this time of much lesser quality than the one on May 24. While the location points to Brampton, the error associated with the reading is considerable, and it is easily possible that he is still somewhere in North York. We have also just received a report of a peregrine with transmitter seen near Yonge & Finch within the past couple of days, and suspect that this may also be Lightning. May 24, 2002: 43.8N, 79.4W (North York, Ontario). Marcel Gahbauer reports: GREAT NEWS! Not only was Lightning's transmitter functioning again today, but he is back in Toronto! We received just a single location report from his transmitter, but it was of reasonably good quality and placed him roughly in the York Mills / Bayview area of North York. A couple of days earlier, a reliable observer had watched a peregrine wearing a transmitter feeding on a gull at the Toronto Island airport - it is possible that the bird seen was Lightning. We are hopeful that Lightning's transmitter will remain active for its next broadcast window around May 28 or 29, and if it is we will report it here of course. However, realizing how it has faltered of late, we also ask again that everyone keep an eye open for a peregrine wearing a backpack antenna, and report sightings to us at track-em@peregrine-foundation.ca. May 22, 2002: location unknown. Marcel Gahbauer reports: Nearly two more weeks have gone by, and there is unfortunately no news to report. The May 1 signal from Albany remains the last report we have had from Lightning. Many people are asking where we think Lightning may be. We simply don't have enough information to make an educated guess. The movements of young peregrines are still not all that well understood - that after all is why we are undertaking Project Track-'em! We know that some individuals come back from migration and quickly settle on a territory, while others may roam for weeks or months in search of a territory and/or a mate. Lightning might fit in either category, but for as long as his transmitter was working, he seemed to be on the move, so chances are that he has traveled beyond Albany as well. We will continue to hope that he eventually settles into one place long enough for someone to spot him and his antenna, and report his location to us. We will post an update on this page as soon as we have any news at all regarding Lightning. May 9, 2002: location unknown. Marcel Gahbauer reports: More than a week has passed since any reports at all came in from Lightning's transmitter. It may be that the battery has finally died completely. Considering the past few locations we did receive from Lightning, it appears that he has not yet settled down anywhere yet, so chances are that by now he could already be far away from Albany again. We still hope to relocate Lightning eventually, but will have to count on the help of you, our readers, to accomplish this. Please keep an eye out for a peregrine wearing a backpack antenna, and ask others to do the same. Report any possible sightings to us at track-em@peregrine-foundation.ca. We will continue to update Lightning's page with any news we receive, either from the transmitter, or from observers. May 1, 2002: 42.7N, 74.0W (Albany, New York). Marcel Gahbauer reports: Lightning's transmitter signal tonight was again weak, but at least had enough power to identify a location. According to the report, he is now near Albany, New York. However, there is a fair amount of error associated with this signal, so he could be anywhere within that general area of New York State. Again, the signal may not last much longer, and we would appreciate reports of any potential visual sightings. Apr 27, 2002: location unknown. Marcel Gahbauer reports: We remain in suspense. Tonight a single transmission did come through from Lightning, but it was again too weak for the satellite to determine the source of the signal. It looks like we will have to wait another four days for our next opportunity to get an update on his location, and will have to hope that there remains enough power in the battery to get at least one more set of clear signals out. In the meantime, we encourage everyone in the Lake Erie and Lake Ontario basins to keep an eye out for Lightning, as he is likely somewhere in that area now - if you do see a peregrine wearing a backpack transmitter, please e-mail us with details of your observation at track-em@peregrine-foundation.ca. Apr 26, 2002: location unknown. Marcel Gahbauer reports: No news from Lightning tonight, so hopefully there will be a report tomorrow evening instead (the summary of daily reports reaches us around 9:30 pm every night). Meanwhile, the Toronto Star has printed another article about Lightning. Apr 22, 2002: 41.5N, 81.7W (Syracuse, Indiana). Marcel Gahbauer reports: We are fortunate to have received another report from Lightning tonight, albeit another relatively weak one. Still, at least this time we are certain of his approximate location, a short distance southeast of Goshen, Indiana, near the small town of Syracuse. This location suggests that of his two possible locations on April 18, the Wisconsin report is more likely to have been his true position. If so, his pattern of movement is somewhat similar to what Nate exhibited in his first spring migration, when he overshot to the north, west of Lake Michigan, then returned to southern Michigan between Lake Michigan and Lake Erie, before heading back into southern Ontario. If Lightning continues along this same sort of path, we would expect his next report to come from Ontario, likely in the Greater Toronto Area. If his transmitter continues to function, this signal should come to us on Friday April 26 or Saturday April 27, and we will update this page again at that time. Apr 20, 2002: Marcel Gahbauer reports: We have received numerous e-mails following our latest report on Lightning from April 18, most of them questioning how the two possible locations could be so far apart. At its very simplest, the problem is that the satellite determines the origin of the signal via Doppler shift analysis, and if it does not receive enough distinct signals within a single transmission period, it is unable to distinguish reliably between the actual location and a second point equidistant, but on the opposite side of the satellite's track. If Lightning's transmitter continues to operate, we expect the next report in the evening of April 22 or 23, and there likely will not be another report here before then. However, should be be fortunate enough to receive news from anyone who has seen Lightning in person, we will of course post the news here as soon as possible. Apr 18, 2002: 43.4N, 87.7W (Port Washington, Wisconsin) OR 44.8N, 80.0W (Penetanguishene, Ontario). Marcel Gahbauer reports: After missing the last report from Lightning, we received one tonight, but the signal was again weak, and due to the poor quality we can't be certain which of two potential locations he is actually at. The Wisconsin data point, roughly 30 kilometres north of Milwaukee, is the more likely of the two locations based on the data presented to us, though the Ontario location along the shore of Georgian Bay would make good sense as well. We will have to hope that his transmitter lasts just a bit longer so that we can make better sense of Lightning's final destination this spring. It's interesting to note that in either case, he appears to have overshot his expected return to southern Ontario. Apr 14, 2002: location unknown. Marcel Gahbauer reports: We had been expecting a report from Lightning's transmitter either last night or tonight, based on the usual 4-5 day cycle that the unit is programmed for. However, none has been received. The battery in his unit has become noticeably weaker in recent weeks, and it is possible that it has now failed entirely; alternatively it may have simply slowed down, and it's possible that we will still get further updates in the coming days. We are anticipating that Lightning could be back in southern Ontario within just a few more days, so we ask that everyone keep a lookout for peregrines wearing backpack satellite transmitters, and report any such sightings to us by e-mail so that we can track their location even if the units are no longer broadcasting. Apr 10, 2002: Marcel Gahbauer reports: Lightning's maps (above) have been updated. Apr 4, 2002: 21.3N, 86.2W (Cancun, Mexico???). Marcel Gahbauer reports: Over the past few months, Lightning has surprised us on more than a few occasions. However, today's reports from his transmitter are truly baffling. Rather than heading north from Cuba toward the Florida Keys as expected, Lightning appears to have instead aimed for the longer water crossing from Cuba to Mexico's Yucatan peninsula! Once again, today's reports were not of the best quality, but nonetheless, strong enough to clearly show that Lightning has struck out to the west, rather than the north. In the past, Nate has regularly taken a more westerly route (through Mexico and Texas) in the spring compared to the fall, but for Lightning to do the same is much more of a detour. Will Lightning realize his mistake and return northeast toward Florida, or will he instead head north along the west edge of the Gulf of Mexico? Our next chance to learn where he is will likely be late on April 8 or 9. Mar 31, 2002: 23.1N, 82.0W (Jaruco, Cuba). Marcel Gahbauer reports: Lightning has started his migration! Today he is in Cuba, roughly 20 kilometres east of Havana. It appears that he is more or less retracing his route from the fall, and presumably will make the flight across the water to Florida within the next day or two, and will then head north through the eastern United States. Mar 28, 2002: Marcel Gahbauer reports: Added to the website today is the "Peregrine Profile" published in the Canadian Peregrine Foundation newsletter "Talon Tales" earlier this month. Note that the article was printed on March 5, just before Lightning truly became the centre of attention in the Dominican Republic. Click here for the article. Mar 27, 2002: location unknown. Marcel Gahbauer reports: The latest reports have just arrived from Lightning's transmitter. They were from early this morning, but unfortunately, no clear location was identified. It may be that the large storm stretching from Canada down to the Gulf of Mexico last night interfered with signal reception. Unless we receive reports of visual sightings of Lightning in the coming days, we will have to wait until the evening of March 31 for our next opportunity to learn where he is. Mar 22, 2002: 19.5N, 70.8W (near Santiago, Dominican Republic). Marcel Gahbauer reports: Today's satellite telemetry report from Lightning indicates that he is still near Santiago. The strongest signal was from a few kilometres northwest of the city, but another weaker transmission later was from an area northeast of Santiago, so it seems that he might be moving around a bit. Mar 21, 2002: Marcel Gahbauer reports: No report from Lightning's transmitter tonight, so it presumably is going to come in tomorrow evening instead. In the meantime, to recognize the support we have received recently, we have added to the website a section on Raptors of the Dominican Republic, featuring in particular the two endemic species, the Ridgway's Hawk and the Ashy-faced Owl. Thanks especially to Pedro Rodriguez and Simón Guerrero for providing information for this new section of the website. Mar 17, 2002: 19.4N, 70.7W (Santiago, Dominican Republic). Marcel Gahbauer reports: The latest reports have just come in from Lightning's transmitter, and they indicate that he has returned to Santiago. Mar 16, 2002: Marcel Gahbauer reports: No news of any kind about Lightning today. We expect the next satellite transmissions to come through tomorrow evening, and if they do, I will post them immediately (around 9 pm Eastern time). Meanwhile, Listin Diario today printed an editorial about Lightning - see the articles below for a rough translation of the story. Mar 15, 2002: Marcel Gahbauer reports: 7:00 am. This morning the Santo Domingo newspaper Listin Diario printed an article describing the attack and capture of "Lightning" yesterday (see translation in articles section below). The photos accompanying the story show a red-tailed hawk, so it appears that Lightning himself was not actually involved in this incident. They further report that the bird captured does not appear to be severely injured, but that it will be transferred to the Santo Domingo Zoo today for further examination by the avian experts there. See photos of the hawk, and also check out the new watercolours contributed by Pedro Rodriguez. Pedro Genaro Rodríguez reports: 5:30 pm. When we examined the captive bird well we realized this was a hawk that had escaped from captivity. The beak was too long, the tip of the tail was worn out, some of its toes were a mess, and some feathers were missing. This poor bird escaped to freedom, only to find a bunch of curious people wanting to see the greatest star on Dominican skies these days, the Canadian falcon "Lightning". The hawk will now live with the company of other hawks at the zoo in Santo Domingo, in much better conditions. This incident gave us an opportunity to talk more to the media about Lightning, and also to realize how big his popularity has grown. Today in the morning Listin Diario Newspaper only talked about "Lightning being captive in Santiago" (later learned to be incorrect). When we arrived at Santiago we made clear to the Listin Diario Newspaper that the bird captured was not a Falcon (and of course, not Lightning). We were also interviewed by Cadena de Noticias (the Dominican Republic's equivalent of the CBC in Canada). Later at the Fortress of San Luis were the hawk was captured we spoke to the officer in charge of Public Relations and we addressed the media which were also very curious to know about the falcon. We explained that there was a mistake and also about the importance of the Program Track'em. I said that everyone in the scientific community wanted to know what happened to the young first year-peregrines born in captivity, and what their migration patterns were. I have to say that everyone was delighted and I had to answer at least 5 interviews. Miguel Rodríguez, also a member of the Sociedad Ornitologica Hispaniola (SOH) talked to the media about the differences between Falcons and Buteos. Dennis Lorenz, our young specialist in raptors was the first to realize that the bird had been held in captivity. From then on everything fell into its right place. That's why the bird was so tame, and definitely that's why it came down to the ground in a park full of people, wanting to know more about birds of prey. Mar 14, 2002: Marcel Gahbauer reports: As of 6:50 pm Eastern time, we have just learned via both Pedro Rodriguez and Ultima Hora that Lightning was attacked today by several people in Santiago, and was rescued by police who brought him to a veterinarian for examination. To this point we have not received any further news; we will provide updates as we receive them. 8:55 pm. I have just received an e-mail from Pedro Genaro Rodríguez, who writes that he has been in contact with Narciso Acevedo at Ultima Hora, and that " the photographer that took the picture of it was told by the veterinarian that it was a "Sea falcon". Besides the Officer in charge of Public Relations for the police told me that they were feeding it with fish. Besides, Francomacorisanos told me that the falcon was seen today back in town. Everyone is delighted with its return, and they are just waiting for the morning to see it again. I truly hope it is an Osprey indeed." It would therefore appear that the earlier report may have been a case of mistaken identity. We will keep our fingers crossed for Lightning's safety, and will provide additional news tomorrow morning. Marcel Gahbauer reports: Lightning has again moved just a bit further to the northwest, and is now near Villa Bisono, approximately 20 kilometres northwest of Santiago. Mar 12, 2002: Marcel Gahbauer reports: Tonight we have been able to update our website for the first time in five days. Thank you to all for your patience! Please read the reports below from March 8 onward to catch up on all of the news regarding Lightning. We had expected that we might receive a satellite report from Lightning this evening, but it did not arrive. We are hoping that it is simply delayed by one day, as sometimes occurs, and that we will receive a signal instead tomorrow evening. In the meantime, we would like to again thank the many dozens of concerned citizens in the Dominican Republic who have taken the time to write to us with their observations of Lightning and/or their heartfelt wishes for his survival. We know also from these communications that there are many times more people who are equally concerned for his safety but have not contacted us directly. In particular, we would like to recognize the efforts of Pedro Genaro Rodriguez and the newspaper Ultima Hora, who have both continued to be in communication with us daily, and have done wonders for raising awareness about Lightning in the Dominican Republic. The television stations which have provided coverage of Lightning's escapades merit our sincere thanks too - Mr. Bonilla has organized contests through a television program, awarding Felix Vargas Cruz the prize for best video of Lightning, and Felix Alfonso Suarez Ino the winner for best picture of the bird; he also recognized Felipe Rey, a young boy who called the program to ask for protection of the bird. Last but certainly not least, we greatly appreciate the efforts of Neil Thomas, who has helped us immensely by providing rapid and accurate translations of the articles and e-mails we have received in Spanish. Some photos of Lightning are on their way, and we will post them here as soon as possible. We would be delighted to receive additional photos from anyone else who has had an opportunity to take pictures of him - please e-mail them and any other observations to track-em@peregrine-foundation.ca. Mar 9, 2002: Narciso Acevedo reports (translated by Neil Thomas): Dear Sir, cordial greetings from the city of San Francisco de Macoris, which is currently happily benefiting from your scientific study. I’d like to thank you sincerely for communicating about the work we are doing for the paper we work for (ULTIMA HORA) - it’s our commitment to strengthen this type of research being done around the world. I was the first person to write about the Falcon Without Borders, and I will continue to follow the story in my town. I think that although you have been receiving bad news, this is not the feeling of a people which I believe has taken the Falcon to heart in the way in which I assure you they have. Since the moment I saw it all my time has gone into fighting for the bird’s life. I would be grateful for your continuing to keep me posted about where the bird might be, given that since Monday it has not been seen. I and Pedro Genaro Rodriguez hope to send you the photos I took of the bird without borders, which will be fondly remembered by all. Hopefully God will permit you to see the Falcon again. Cordial greetings from San Francisco de Macoris, a city 150 km from the Dominican capital. Mar 8, 2002: 19.5N, 70.8W (Santiago, Dominican Republic). Marcel Gahbauer reports: This evening's satellite transmission confirms the observation of Dr. Franco (from El Embrujo, Santiago) below - as of tonight, Lightning is just a bit west of Santiago. This is his first known visit to Santiago, after almost four months in the Dominican Republic. It represents a move of ~50 kilometres to the northwest from his previous position at San Francisco de Macoris. Is this an indication that he is beginning to get restless and is preparing to head back north? We will have to wait another four days to see where his next satellite transmission places him. Dr. Rene Franco reports (translated by Neil Thomas): Members of the CPF, the falcon Lightning at this moment is in a building approximately 1000 metres from the “Monument to the Heroes of the Restoration”, situated in the town centre of Santiago de los Caballeros, Dominican Republic. The bird has traveled the whole Republic and it’s known that its favourite food includes pigeons, doves and other similar species. This is a tropical region with comfortable temperatures. I would like to know everything about this beautiful bird, which has impressed and become a veritable attraction for the Dominican people. It turned out to be a rare bird with an antenna stuck to its body. Mar 6, 2002: 19.3N, 70.2W (San Francisco de Macoris, Dominican Republic). Pedro Genaro Rodríguez reports: Today, Ultima Hora Newspaper has published its fourth article on Lightning (and there's another one coming tomorrow), all of them announced on their front page!!! Besides the Editorial (message from the editor) is dedicated to this Falcon too. The efforts of the newspaper truly mark an unprecedented action both in defending and focusing on a bird. The newspaper also publishes a letter from the Canadian Embassy in Santo Domingo urging the people to protect this awesome bird. Will keep you informed! Mark Nash reports: It would appear that we have made both a very positive impression, and MANY new friends in the Dominican Republic. The e-mail has been streaming in daily, and the response has been very positive to say the least. A third newspaper article is in the works as we speak, and it would appear that no harm will come to Lightning if they can help it. In addition to local TV, radio, and newsprint, local government officials are involved to help both educate the community at large, and to protect Lightning while he is visiting their country. Our thanks go out to ALL that has helped out with this situation. I would like to personally thank those members of the local Dominican Republic government, local officials, and members of the Ornithological Society, especially Pedro Rodríguez, Mr. Renato Rímoli, Director of Biodiversity, Mr. Eladio Fernandez who is the president of the Ornithological Society , Mr. Narciso Acevedo from the Ultima Hora Newspaper, and the TV producers at the TV show named "La Ventana de Manolo" who aired a special appeal to help out getting the message across the country. It aired both locally, and then nationally in the Dominican Republic. My special thanks to our very special friends in the US Government, and friends around the world that sent in their e-mail appeals to offer their support. I would also like to thank Neil Thomas and his wife Anna for some of the translations, and assisting me with 'my Spanish' - (which I don't speak nor read at all). We will keep our fingers crossed that Lightning starts his home word bound migration SOON. Mar 4, 2002: 19.3N, 70.2W (San Francisco de Macoris, Dominican Republic). IMPORTANT UPDATE! Late last week, we received an e-mail from a resident of San Francisco de Macoris with some very disturbing news. Apparently Lightning has become a regular sight there, and is quite blatant about preying on the local dove population, to the dismay of some people in the area. According to our correspondent, some residents are planning to shoot Lightning to stop him from killing any more of the doves. Ever since that alarming message reached us, a flurry of long-distance phone calls have gone back and forth between the Canadian Peregrine Foundation and a variety of museums and government agencies in the Dominican Republic. The Canadian embassy in Santo Domingo was very helpful in pointing us toward some useful contacts. A long conversation today with someone from the Ministry of the Environment proved very informative. He told us that it is illegal under the laws of the Dominican Republic to kill a peregrine, and the Ministry has no intention of issuing a permit for anyone to harm Lightning. Tomorrow, he and a colleague will travel to San Francisco de Macoris in an effort to locate Lightning and confirm that he is safe, as well as speak to the local people in an attempt to convince them not to take any actions against him. Tonight's satellite report confirmed that he remains in this area. Of course, Lightning also has his supporters in the area. The local ornithological club is delighted with his presence, and also helping to fight for his protection. One of the newspapers featured an article on him this morning, and a follow-up story may be printed in the coming days; we are hoping to receive copies of these (see above). We are hopeful that with the support of the Ministry of the Environment, the ornithological clubs, and the media, Lightning can be kept safe. We will provide updates here as they become available. Feb 27, 2002: 19.3N, 70.2W (San Francisco de Macoris, Dominican Republic). Lightning has again reported to us from San Francisco de Macoris, this time just slightly to the west of the city. Feb 23, 2002: 19.3N, 70.2W (San Francisco de Macoris, Dominican Republic). Once again Lightning has returned to the area around San Francisco de Macoris. Feb 18, 2002: 19.6N, 70.7W (Pedro Garcia, Dominican Republic). Lightning today has reported from a new location, a bit to the northwest of his usual sites. Pedro Garcia is roughly midway between Santiago and Puerto Plata. However, the signal from his transmitter today was weak, and it's possible that the coordinates therefore are somewhat inaccurate. Feb 14, 2002: 19.3N, 70.3W (La Vega, Dominican Republic). La Vega is again the closest town to Lightning's location tonight. Feb 10, 2002: 19.3N, 70.3W (La Vega, Dominican Republic). Lightning continues his local movements, this time apparently closer to La Vega once again. Feb 5, 2002: 19.3N, 70.2W (San Francisco de Macoris, Dominican Republic). Today Lightning is just slightly to the east again, closer to San Francisco de Macoris. However, the quality of the latest transmission was relatively poor, so it's difficult to pinpoint his current location with any accuracy. Feb 1, 2002: 19.3N, 70.3W (La Vega, Dominican Republic). This time Lightning has moved a bit west again, returning to the area around La Vega where he has been on numerous occasions since settling in the Dominican Republic. Jan 27, 2002: 19.3N, 70.2W (San Francisco de Macoris, Dominican Republic). Lightning remains in pretty much the same area as four days ago. Jan 23, 2002: 19.3N, 70.2W (San Francisco de Macoris, Dominican Republic). We are relieved to see Lightning back on land, this time again near San Francisco de Macoris, where he was for a while in late December. Jan 18, 2002: 19.8N, 68.5W (northeast of the Dominican Republic). Today it's Lightning's turn to perplex us. His report from today comes from 100 km northeast of the Dominican Republic, out over the open water of the Atlantic. Presumably this is simply a temporary aberration as we saw with Lionheart and Nate earlier this month. Jan 14, 2002: 19.3N, 70.3W (La Vega, Dominican Republic). Lightning is still hanging around the same area of the Dominican Republic. Jan 9, 2002: 19.3N, 70.3W (La Vega, Dominican Republic). For a third consecutive period, Lightning remains in the area of La Vega. Jan 5, 2002: 19.3N, 70.3W (La Vega, Dominican Republic). Lightning remains near La Vega. He has spent considerably more time in this area than anywhere else since arriving in the Dominican Republic, and it appears that he may finally be settling down. Jan 1, 2002: 19.3N, 70.3W (La Vega, Dominican Republic). To start off the new year, Lightning has shifted just a bit toward the west again, back to the area of La Vega. Dec 31, 2001: 19.3N, 70.2W (San Francisco de Macoris, Dominican Republic). Lightning has returned to San Francisco de Macoris to close out the year 2001. We hope to continue following Lightning's activities throughout the new year. Dec 27, 2001: 19.2N, 69.9W (Villa Riva, Dominican Republic). After more than six weeks in the Dominican Republic, Lightning has still not settled down in one spot. Today he is again heading toward the southeast a bit, near the town of Villa Riva as of the evening. Dec 22, 2001: 19.3N, 70.2W (San Francisco de Macoris, Dominican Republic). Lightning continues to wander back and forth; today he is once again heading a bit to the east within the Dominican Republic. A map summarizing his travels in the country will be posted early in the new year. Dec 18, 2001: 19.3N, 70.4W (La Vega, Dominican Republic). It seems that after a couple of weeks exploring other parts of the country, Lightning has decided to return to the area around La Vega where he spent much of late November and early December. Dec 13, 2001: 19.7N, 71.1W (Maizal, Dominican Republic). Lightning has reversed course, heading back to the northwest. He is now 250 km away from his last location in the eastern Dominican Republic, and approximately 50 km west of Puerto Plata. Dec 8, 2001: 18.9N, 69.2W (Hato Mayor, Dominican Republic). For the first time in over three weeks, Lightning has made a significant move. Tonight he was near Hato Mayor, still in the Dominican Republic, but more than 120 km east of the area he was been in for the past while. Dec 3, 2001: 19.2N, 70.3W (La Vega, Dominican Republic). Lightning has moved slightly to the south, but remains in the same general area of the Dominican Republic. Nov 30, 2001: 19.3N, 70.3W (La Vega, Dominican Republic). There has again been only a short-distance movement from Lightning over the last few days, so it seems that he really is probably going to settle here in the Dominican Republic for the winter. Nov 25, 2001: 19.3N, 70.2W (La Vega, Dominican Republic). Over the past few days Lightning has shifted just slightly to the east, remaining in the interior of the Dominican Republic. Nov 21, 2001: 19.3N, 70.3W (La Vega, Dominican Republic). Lightning has remained in the Dominican Republic, but has moved back toward the lowlands. His most recent location is a bit northeast of La Vega, not far southeast of Santiago. Nov 16, 2001: 18.8N, 71.2W (Pico Duarte, Dominican Republic). It seems that Lightning is enjoying the remote mountains of the central Dominican Republic, as he has shifted only slightly in position since his last report four days ago. Nov 12, 2001: 19.0N, 71.2W (Pico Duarte, Dominican Republic). Lightning's southbound journey seems to have stalled a bit, as he is currently a bit northeast of where he last reported from four days ago. His current position is the highlands of the Dominican Republic, about 10 kilometres east of Pico Duarte, the highest point in the country. Nov 8, 2001: 18.2N, 74.0W (Port-a-Piment, Haiti). This report from November 8 shows that following the passage of Hurricane Michelle through Cuba, Lightning made just a short flight south to Haiti. This series of reports indicated that he was resting near the southwest end of the country, near the town of Port-a-Piment. Oct 30, 2001: 20.9N, 76.9W (Eastern Cuba). Lightning has become the first of this year's peregrines to leave North America! His position appears to be roughly midway between Camaguey and Holguin. If he follows in the footsteps ("wingsteps"?) of birds we have tracked in the past, chances are good that our next report from Lightning will come from Panama or Colombia ... or neighbouring countries. Oct 25, 2001: 37.5N, 75.3W (Norfolk, Virginia). Unlike Ruby, Lightning showed no interest in lingering around New York City for any length of time. His reports today come from just offshore east of Norfolk, Virginia. It appears that he passed over or near Assateague Island, which has long been recognized as a peregrine migration hotspot. Oct 21, 2001: 40.9N, 74.0W (New Jersey). Lightning has made his move! After making a couple of false starts, Lightning is at last clearly on the way south. Incredibly, he has headed straight for the New York City area, just like Ruby a couple of months ago. The latest report we received from Lightning today had him approaching New York from the northwest, around Fairlawn, New Jersey. This put him only 40 km NNW of Ruby's most recent position. It will be interesting to see whether they come even closer together, or whether for Lightning this represents just a stopover point on his way further south. Oct 17, 2001: 43.8N, 79.4W (Richmond Hill). The side trip to Guelph seems to have been just a temporary diversion for Lightning, who is back home at the Richmond Hill Town Hall as of tonight. Interestingly we received a signal from Lionheart at the same location just twenty minutes earlier, so it would seem that Lightning and Lionheart are still spending at least some time together. Oct 12, 2001: 43.5N, 80.3W (Guelph). Lightning appears to have lost interest in North York, at least for the time being. Today he was along the southern edge of Guelph, near the University of Guelph campus at times, and also slightly further south late in the day. Oct 7, 2001: 43.7N, 79.3W (North York). Today Lightning was on the move again, shifting back to the Don Valley, but further south than before. His coordinates from this afternoon put him around the Ontario Science Centre near Don Mills & Eglinton. As a peregrine flies this is not far from where he has been hanging out at Yonge and Finch, so he may well return there again. Oct 3, 2001: 43.8N, 79.4W (North York). Lightning has moved very little since his last report, and again appears to be around Yonge and Finch. This is consistent with local observers, who have spotted a transmitter-wearing peregrine frequenting one of the office buildings in the area. Sep 28, 2001: 43.8N, 79.4W (North York). Today's strongest signal from Lightning came again from Yonge and Finch. Several observers working in the area have also observed two peregrines wearing satellite transmitters over the past week, suggesting that Lightning and Lionheart are hanging out here together. Sep 24, 2001: 43.8N, 79.4W (North York). Lightning remains in North York, but has shifted a bit to the southeast, to the area around Leslie and Sheppard. Sep 20, 2001: 43.8N, 79.4W (North York). Lightning continues to explore the northern limits of Toronto. This afternoon he was in the area of Yonge and Finch, perhaps attracted to some of the tall buildings near downtown North York. Sep 15, 2001: 43.8N, 79.2W (Scarborough). Today Lightning headed back east again, making it as far as the Metro Toronto Zoo in the northeast corner of Scarborough. Whether he was just flying past when we received this signal, or he actually stopped in for some sightseeing we don't know - if anyone visiting the zoo today spotted a peregrine, please let us know. Sep 10, 2001: 43.9N, 79.4W (Richmond Hill). Lightning is just a bit north of the Richmond Hill Town Hall today, perhaps hanging out near the Buttonville airport again. Sep 6, 2001: 43.8N, 79.4W (Richmond Hill). So far it seems that Lightning doesn't want to follow his brother Lionheart's lead in exploring away from home. He's right back in the area of the Richmond Hill Town Hall again. Sep 2, 2001: 43.8N, 79.3W (Markham). This time around, Lightning has swung back east again, a bit beyond the Richmond Hill Town Hall. Aug 28, 2001: 43.8N, 79.5W (Maple). Lightning continues to wander about the areas north of Toronto. His first report today came from near the Richmond Hill Town Hall, but later in the day he moved west to the east side of the town of Maple, around Keele & Major Mackenzie. Aug 24, 2001: 43.8N, 79.4W (Richmond Hill). Lightning is back at home near the Richmond Hill Town Hall. Aug 19, 2001: 43.9N, 79.3W (Markham). Lightning has roamed to the east, visiting the old town of Markham around the intersection of highways 7 & 48. Aug 15, 2001: 43.8N, 79.4W (Richmond Hill). Tonight's report from Lightning indicates that he's right at home around the Richmond Hill Town Hall. Aug 10, 2001: 43.8N, 79.4W (Richmond Hill). Lightning was exploring a bit to the west today, with his transmitter reporting to us from between Yonge Street and Bayview Avenue along Highway 7. Aug 6, 2001: 43.8N, 79.4W (Richmond Hill). Tonight's signal from Lightning indicates that he is back at home in the vicinity of the Richmond Hill Town Hall. Aug 2, 2001: 43.9N, 79.3W (Markham). Reports received today indicate that Lightning is already exploring a bit away from home - the strongest signal came in from the area of Warden & 16th Avenues, about 4 km northeast of the Richmond Hill Town Hall. Certainly not a long flight by peregrine standards, but a significant range for a bird which has been flying for only one week. Aug 1, 2001: 43.8N, 79.4W (Richmond Hill). This afternoon Lightning became the fifth peregrine equipped with a satellite transmitter for the 2001-2002 season. He was captured in the hack box, and then brought in to the Council Chambers at the Richmond Hill Town Hall where Mark Nash applied the transmitter with the help of Amy Mui. The first signals from the transmitter confirmed his location within a couple of hours of release, and we look forward to the next report from him on August 5 or 6.